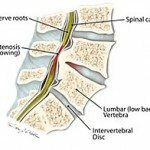 Spinal Stenosis is a narrowing of the spine, and typically affects patients as they age. This progressive tapering of the spine places pressure on the spinal cord and surrounding nerves, causing painful symptoms in the back, neck, and shoulders. Symptoms associated are acute pain, numbness in the extremities, and muscle weakness.